In Microsoft Word, you can change capitalization in a document using the Change Case button. It includes options for Sentence case, lowercase, UPPERCASE, Capitalize Each Word, and tOGGLE cASE. Does Google Docs have anything similar for auto-correcting capitalization? 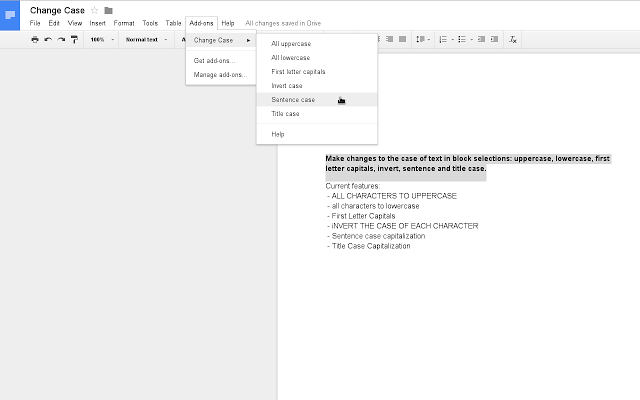 The Change Case addon for Google Docs should do the trick. Make changes to the case of text in block selections: uppercase, lowercase, first letter capitals, invert, sentence and title case. How to disable auto-save in Google Docs? Why do unwanted changes occur when uploading Word doc to Google Docs? Can I convert a MS Word document to a Google Document format using GAS? How to change the language setting of a Google Doc? What does “All changes saved locally” mean? Does Google Docs support variables?